Pick a Livingstone you want to explore, and there is a biography written with that slant. Interested in a devout explorer? Try the The Life of David Livingstone by William G. Blakie (1905). Most modern treatments try to balance this older view, though they tend to undersell Livingstone’s missionary ambition. Oliver Ransford explores the psychological makeup of the man in his David Livingstone: The Dark Interior (1978). George Martelli, in Livingstone’s River (1969), focuses on the Zambezi Expedition, which leaves the reader with a more troubling view of the explorer. For a truly engaging and balanced biography, read Livingstone (Trafalgar Square, 1994) by novelist Tim Jeal. The three books Livingstone wrote still make for gripping reading, especially the first: Missionary Travels and Researches in South Africa (recently republished by Ayer Co.). His other two accounts are Narrative of an Expedition to the Zambezi and Its Tributaries (1865), and Last Journals of David Livingstone in Central Africa: 1858–1873 (1875), edited by Horace Waller. 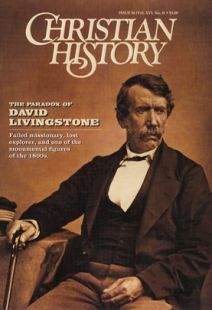 To get a glimpse of the private Livingstone, you’ll want to see two books edited by I. Schapera: Livingstone’s Private Journals (1851–1853) (1960) and David Livingstone: Family Letters (1841—1856) (1959). Mark R. Shaw’s The Kingdom of God in Africa: A Short History of African Christianity (Baker Books, 1996) is a readable survey with the growth of the church the controlling theme. Elizabeth Isichei’s A History of Christianity in Africa (Eerdman’s, 1995) goes into a bit more depth. At 683 pages, Adrian Hastings’s The Church in Africa, 1450–1950 (Clarendon, 1994) is thicker still, though it keeps its focus on the last 500 years. Milton Meltzer’s Slavery II: From the Renaissance to Today is a well-written and illustrated overview of the topic. And for a fast-paced account of the post-Livingstone political history, see Thomas Pakenham’s The Scramble for Africa: The White Man’s Conquest of the Dark Continent from 1876 to 1912 (Random House, 1991). Teachers may want to check out the Chicago Science Explorers page devoted to Livingstone (http://www.chias.org/www/edu/cse/folhome.html). It offers teaching guides for In the Footsteps of Dr. Livingstone, a video about the man (David Livingstone Wilson, the explorer’s great grandson, in fact, recreates the journey in search of the source of the Nile) and the era. The Africa Collection (http://pearl.amnh.org/collect/africa/africa.htm) is a virtual museum of the American Museum of Natural History, dating from 1869, showing samples of African art. The Victoria Falls page (http://www.unicc.org/untpdc/incubator/zwe/tphar/vrz1000e.htm), part of Virtual Zimbabwe, gives a fuller description (with pictures) of Livingstone’s greatest discovery. Finally, Time.Gate: The Zanzibar Network (http://www.timegate.demon.co.uk/note.htm) has a page called “Explorers and Empire Builders,” which gives an overview of key figures in 1800s Africa. Little-known or remarkable facts about William Carey. William Carey was an unlikely candidate for the title many now bestow on him: Father of Modern Missions. How a lukewarm Anglican became a fiery Baptist.